Part I examined the military implications of China’s continued “military” actions versus Japan in the East China Sea or the United States and other countries in the South China Sea if China were to establish an ADIZ. Part II examines whether China has real economic or trade leverage to force other countries, including the United States, to support its point of view regarding the ruling. Part II also analyzes the related question of whether there are costs to China from continuing to ignore the legal ruling and ways in which China can be legally compelled to comply. Shortly after the Tribunal ruling, China’s Deputy Minister of Trade was careful to encourage Chinese citizens to not boycott the U.S. and the Philippines; however, that does not mean that sanctions and boycotts are off the table. Bloomberg reported on August 4th that China will likely resume trade retaliation tactics against South Korea for its decision to deploy U.S. THAAD missiles to counter North Korean missile launches. 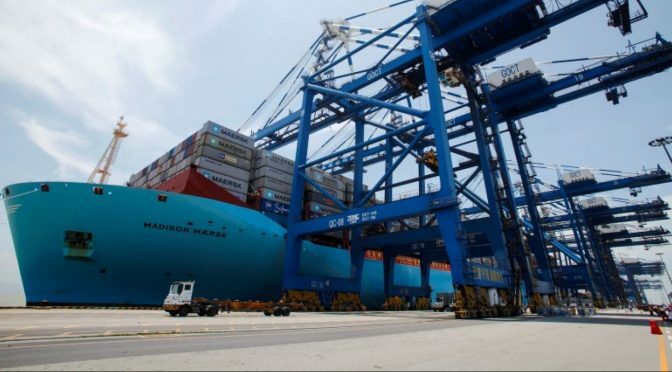 Korea’s International Trade Association has identified 26 measures currently in place to restrict trade and is expecting more non-tariff barriers such as bogus safety inspections of inbound products, establishment of new licensing requirements, and manipulation of quarantine and safety inspections to frustrate Korean imports. The above actions are not unprecedented. In 2000, China banned all imports of South Korean mobile phones and polyethylene in retaliation for Seoul’s increase of duties on Chinese Garlic. In 2010, Chinese Customs Officials halted the shipments of rare earth minerals destined for Japan (for user in hybrid cars, wind turbines and guided missiles) as a form of protest for detention of a Chinese fisherman fishing near the Senkakus. The United States has also been victimized by China’s extensive unfair trade practices (dumping and illegal subsidies), theft of intellectual property, and hacking of U.S. companies. Working within the WTO system, the U.S. has filed a record number of suits versus China in the WTO on behalf of U.S. poultry producers and is now considering the unilateral institution of a total ban on Chinese steel imports because of illegal price fixing and other illegal actions by Chinese steel producers. The use of non-tariff barriers has been a favorite ploy by countries to sneakily frustrate imports to protect local producers while at the same time staying compliant with WTO rules. As for embargoes, WTO (Art 21) recognizes that states can impose measured national security, health, and welfare controls on both exports and imports to protect their citizens’ “essential security interests” or to prevent the proliferation of weapons. Using this exception, China passed a new national security law in 2015 which required foreign technology companies to be “secure and controllable” by Chinese National Security Agencies as a way of pushing out foreign technology firms like Microsoft, Apple, and Cisco in favor of local suppliers. However, there are limits to this type of activity, as witnessed in the 1998 Shrimp Turtle Decision in which a WTO Panel found that a U.S. ban on shrimp from India, Malaysia, Thailand and Pakistan (because those states shrimp fishermen had allegedly killed Sea Turtles) was illegal because controls can only be used to immediately protect one’s own citizens from harm. Controls cannot be used to “send signals” or indirectly pressure an exporting state to reform. In the short term, China has considerable legal room to maneuver should it wish to impose national security controls or erect non-tariff barriers to punish Japan, the United States, the Philippines, and others for opposing them in maritime disputes. WTO cases are very time consuming to document and litigate. However, that same legal maneuver space can also be exploited by the United States and others to frustrate Chinese imports. Therefore, China should do the math and assess whether they have more to gain or lose by instituting de facto embargoes. In 2015, China amassed a $365 billion merchandise trade surplus with the United States. Chinese businesses have put this cash to good use by investing in new plants and equipment, educating its young people abroad, and investing billions in the U.S. and other safe offshore markets. This is not unique to the U.S.; China has a global trade surplus of $600 billion. It continues to have small trade deficits with Japan and South Korea and its principal imports are electrical and industrial machinery (no. 1 and 3), oil (no. 2), and ores (no. 4). This cursory analysis of China’s economy overwhelmingly demonstrates that China is highly dependent on international trade to fuel its economy. China’s offshore investments of its U.S. trade surplus helps China diversity its holdings outside of Asia. China is also heavily reliant on international suppliers for the raw materials it lacks and risks a great deal by starting a trade war in which it is deprived access to the U.S. and other foreign markets. History confirms that China would likely suffer more than the U.S. or Japan, Australia, and the Philippines as a result of an embargo. Tough Allied embargoes against Nazi Germany and Italy proved ineffective when self-interest among allied business interests caused the embargoes to leak or, in the case of Germany, forced innovation when Germany developed synthetic substitutes for oil and other commodities. When the U.S. embargoed wheat exports to the USSR in 1973, Canada and Australia picked up the business. The latter is especially important in the current situation. If China were to stop buying Australian ore or Japanese finished products, the world economy is sufficiently diverse to compensate for some of these losses. After the U.S. embargoed exports of scrap iron, steel, and oil to Japan and froze Japan’s assets, Japan was put into the position of having to choose between fighting for additional raw materials or abandoning their plans for a “New Order” in Asia. It is unlikely that any country would launch a Pearl Harbor attack if China were to embargo their products; however, embargoes have a high potential for “blowback” and could result in unintended consequences to the PRC’s overseas businesses, mines, and industrial operations. Sanctions and embargos tend to “leak” because the global market will almost always produce another supplier or purchaser of something that is being withheld from the international market. Philippine bananas and mangos also taste good in Tokyo, Paris, and New York. Given China’s extreme dependence on international trade to fuel its domestic growth and overseas investment, it would be almost suicidal for China to engage in actions that might restrict its access to foreign markets. Likewise, a government-lead boycott of foreign products would, apart from the legal repercussions, would have extremely destructive impacts on its economy since it still relies heavily on imports of agricultural products, industrial equipment (from mostly Japan and Korea), and metal ores for manufacturing applications. Finally, dumping U.S. debt might cause some angst but, in the long run, U.S. debt instruments would be purchased by investors in the U.S. and other countries. China continues to condemn the Tribunal ruling. The traditional attacks focused on questions of lack of jurisdiction and “overstepping” its legal mandate. Another Chinese daily’s reported that the Tribunal was a “front” for the United States and “lackey” of outside forces and had an inherent bias because the Philippines paid the “court costs” for the proceeding. A few speculated that China might withdraw from UNCLOS, but China will more likely establish its own arbitral panel to adjudicate the territorial disputes outside of UNCLOS. This later course of action has precedent; recall China’s 2015 establishment of an Asian Infrastructure Bank to finance Asian infrastructure projects outside of the regulation-burdened World Bank system. Money talks. For this reason, states that would ordinarily have been silent registered their support for the Tribunal decision. The EU issued a statement on July 15, underscoring their support for a rules-based order and respect for UNCLOS. The G-7 called on states to “fully implement decisions binding on them in … tribunals under the Convention.” Canada, France, Germany, the UK, Japan, Vietnam, Singapore and the U.S. issued statements support of the ruling. Indonesia, India, South Korea issued more “measured” statements urging China to show restraint and respect for UNCLOS. There were some dissenters, but much of the industrial world supported the outcome and expects China to comply. If China continues to signal that it has no interest in conforming to the ruling, China could be excluded from important international negotiations, including, for example, the upcoming negotiation of an agreement under UNCLOS that deals with biodiversity beyond national EEZs. As I suggested in After The South China Sea Arbitration, China could have its privileges essentially suspended in three UNCLOS institutions: (1) the International Tribunal for the Law of the Sea (ITLOS); (2) the International Seabed Authority (ISA), and the (3) the Commissions on the Limits of the Continental Shelf (CLCS). If China continues its island-building activities and interferes with Philippine fishing in the vicinity of Second Thomas Shoal, Scarborough Shoal, and Mischief Reef, an international court such as the International Court of Justice (ICJ) or ITLOS, could be asked to impose sanctions on the China for flaunting a lawful UNCLOS decision. The case would be predicated on the notion that China cannot take advantage of the benefits of UNCLOS if it lives outside of the law. In practical terms, an injunction could be sought which: recalls China’s judge on ITLOS; blocks the CLCS from any further proceedings involving the Continental Shelf entitlements of China; and lastly suspends both China’s ability to file further deep-seabed mining applications before the ISA and enjoin any further prospecting of its sites in the Indian Ocean. 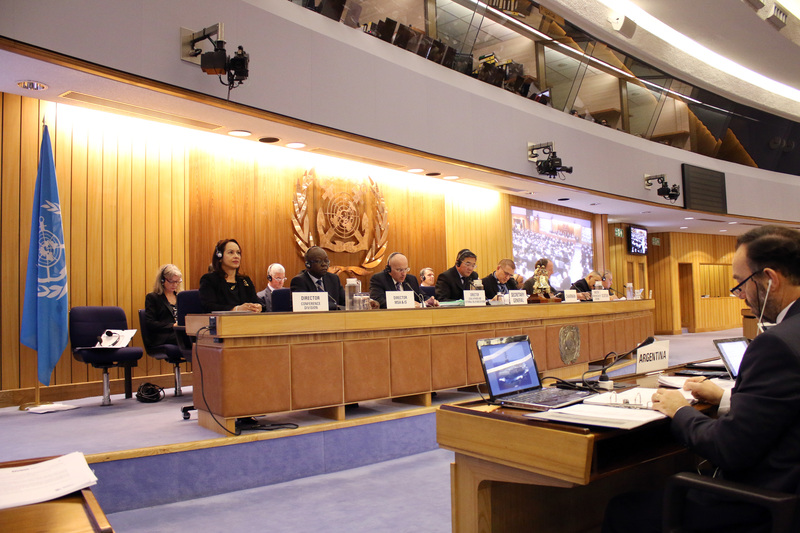 It might also be appropriate for a Tribunal to suspend China’s participation in UNCLOS related bodies including the International Seabed Authority (ISBA) (which writes the regulations for deep seabed mining), the International Hydrographic Organization (IHO) (the charting and oceanography body) and the International Maritime Organization (IMO). The latter action would be especially harmful for China given that the IMO has broad responsibilities to write the rules for merchant ship design, construction, operations, and navigational routes/practices while China has one of the largest merchant marine fleets in the world. Inexorably, China is painting itself into a corner in which its escape options become more limited. While it was hoped by officials in the U.S. and elsewhere that China would eventually come to the realization that it needed to capitalize on the favorable aspects of the ruling and “pivot” on those it did not like, that is not happening. The recent military displays in the ECS and SCS, the threatened sanctions towards South Korea, and continued “trashing” of the Tribunal ruling suggest that China is opting for confrontation versus conciliation and now runs the risk of becoming involved in a major military conflict with Japan and perhaps the United States. China says that it is committed to a rules-based order and leadership in Asia but its recent actions say otherwise. Lastly, and perhaps most importantly, pursuit of high risk strategies which could place China’s international trading relations at risk is antithetical to the Chinese Community Party’s 13th Five Year Plan for 2016-2020 to promote balanced international trade, inbound investment, and free trade zones. It is entirely possible that China’s leadership does not fully appreciate the dangerous choices their countrymen are making and how their actions are being perceived on the world stage. Military-to-military encounters at sea are occurring on a daily basis, and the potential for a costly misstep increases with each passing day. So too, a miscalculation in the trade or economic arena would likely backfire since China is a trading nation and it can ill afford to have its products excluded from foreign markets. High-level diplomacy and cool heads should be the order of the day. A maritime and international lawyer, Mark E. Rosen is the SVP and General Counsel of CNA and holds an adjunct faculty appointment at George Washington School of Law. The views expressed in this paper are those of the author alone and do not represent the views of CNA or any of its sponsors. The following is a two-part series on China’s possible reactions to the Arbitration Ruling in its dispute with the Philippines. In Part I, the military implications of China’s recent and possible future actions are analyzed. Part II will look at the likely outcome of China using economic and legal leverage to register its displeasure with the ruling. The Arbitration Panel’s ruling against China on July 12 was a stinging blow to China’s international prestige. China advanced a narrative that it had historic rights to nearly the entirety of the South China Sea (SCS), and that it could prevent states like the Philippines and Vietnam from fishing in their Exclusive Economic Zones (EEZs) and drilling for oil near their coasts. China also maintained, through its actions, the right to engage in island building and fishing practices which caused severe damage to the marine environment. Since these activities occurred inside of its Nine Dashed Line Claim (9DL), China felt justified in these “internal matters” and told its neighbors in almost evangelical terms that the SCS is their patrimony and that no country or international body has a right to mess in their domestic affairs. On all these counts, the Tribunal disagreed and issued a strong rebuke of China’s activities. The few positive signs that China is receptive to peaceful resolution and has moved past the ruling have been overtaken by a number of very disturbing trends which, regardless of which path China ultimately takes, puts it on a collision course with Japan, the United States, or even a much broader group of states. Unless something dramatic emerges as a result of the secret conclave in Beidaihe, the negative developments seem to overwhelmingly demonstrate that China’s gaze is only focused on settling scores with the U.S., Japan, Vietnam and the Philippines, because these states are responsible for its legal embarrassment and loss of face within ASEAN. On July 13, China sent civilian aircraft to two new airports on Mischief Reef and Subi Reef. This action was taken in spite of the Tribunal’s ruling that Mischief Reef is a low-tide elevation and part of the Philippine continental shelf, and Subi Reef is a low tide elevation and part of the territorial sea of Itu Aba. In both cases, low-tide elevations cannot be appropriated by China. On July 15, China posted images of its recent overflight of the highly contested Scarborough Shoal by nuclear capable H-6K bombers (and escorts) and announced that such patrols would be a “Regular Practice.” This announcement came the same day as the U.S. Navy’s Chief of Naval Operations (CNO) Adm. John Richardson was visiting his Chinese counterpart, Adm. Wu Shengli. On July 18, Press reports cited Adm. Wu Shengli as warning the U.S. CNO that future U.S. freedom of navigation operations “will only backfire” and that Beijing will complete its planned land reclamation and reef reclamation and has made “sufficient preparations” to deal with any sovereignty infringements. On July 19, China’s vice minister of commerce Gao Yan told reporters that trade relations between China and the Philippines were “mutually beneficial,” and added that the government did not endorse calls within China to boycott Philippine products. There were also reports of Chinese activities smashing iPhones and massing protests in front of KFC restaurants in several cities. On July 24, ASEAN failed to achieve consensus to issue a statement on the Tribunal decision after China’s ally, Cambodia, broke away from a consensus document that was being proposed by the Philippines, Vietnam, and others. On July 25, the United States, Australia, and Japan held a Trilateral Strategic Dialogue and issued a statement expressing “their strong support for the rule of law and called on China and the Philippines to abide by the Arbitral Tribunal’s Award of July 12 in the Philippines-China arbitration, which is final and legally binding on both parties.” The ministers also expressed opposition to any coercive or unilateral actions that could alter the status quo including future land reclamation activities. On July 28, The Chinese Defense Ministry announced plans to hold a joint military exercise with Russia in the SCS in September; the first such bilateral exercise in that body of water. On August 1, China held a significant live fire drill in the East China Sea (ECS) that included the firing of “dozens” of missiles and torpedoes. (AP, Aug 2, 2016). There were also reports that six PRC coast guard vessels and over 200 fishing vessels swarmed in the vicinity of the Senkaku/Diaoyu Islands. On August 2, Japan’s Ministry of Defense published a white paper describing China’s position on the SCS an object of “deep concern.” China’s Ministry of Foreign Affairs called Japan’s paper “full of malice,” “lousy clichés,” and “irresponsible” and a smokescreen to obscure Japan’s expansionist arms policies. This exchange of statements was then followed by North Korea’s firing of a ballistic missile into Japan’s EEZ on August 3. When the UN Security Council sought to condemn North Korea’s actions, China “curtailed” the Security Council’s actions. On August 2, China’s Supreme People’s Court clarified China’s 2014 Fishing Regulation to the effect that those that engage in illegal activities inside of the waters claimed by China will be arrested and tried as criminals. This decision settled past differences of opinion as to whether China’s EEZ and Territorial Seas empowered Chinese officials to pursue criminal liability for those involved in illegal hunting or fishing in China’s jurisdictional seas. The practical import is that fishing within the 9DL area will be met with vessel seizure and imprisonment. On August 2, Malaysia joined Indonesia in announcing that they would sink any foreign ships that are fishing in their claimed waters. This statement was a veiled threat to China that had allowed its “fishing militia” to fish in waters claimed by both countries. 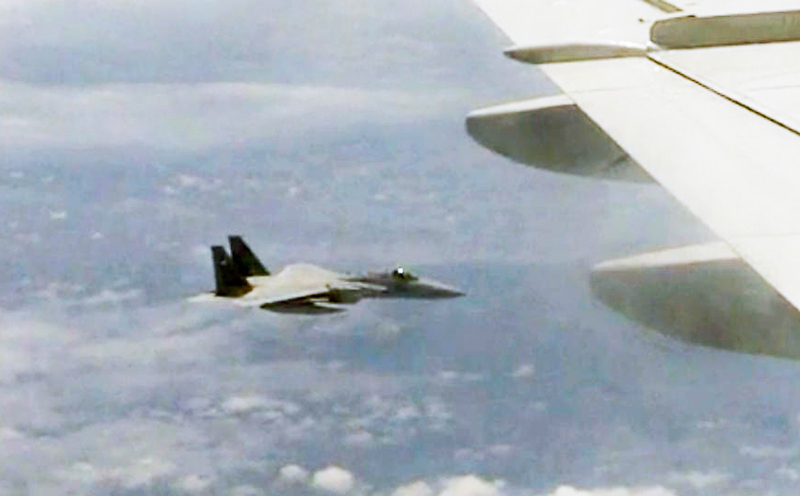 On August 6, China sent bombers and fighter jets on patrol in the vicinity of “Scarborough Shoals.” China announced that these flights would be a “regular practice” to “normalize South China Sea combat patrols” to safeguard its sovereignty interests. Much like current U.S. presidential campaign antics, it is hard to imagine what is likely to happen next in the high stakes poker game being played out in Asian waters. Taking into account what has happened to date and where China believes that it has leverage, there are three possible ways in which China might lash out: military, economic, and legal. The statements by China’s Chief of the Naval Staff and its military activity near the Senkakus suggest that China is employing tactics of intimidation to get Japan to back away from its recent statements over the Tribunal’s decision. It may also be the case that the presence of swarming vessels in and around the Senkakus and the North Korean missile shot (presumably with tacit PRC approval) suggest that China is trying to goad Japan to militarily respond or back off its claims. The Senkakus have always been the powder keg of Asia because it features the two leading powers in Asia: one ascending and one arguably in decline both competing on the world stage. Both are rivals for dominance over a tiny scrap of land and associated maritime space which, given the implications for access to fisheries and oil and gas, is not irrational. This is somewhat ironic because the Tribunal decision in China v. the Philippines takes away much of the incentive for the two states to fight over these rocks since they would be enclaved within the continental shelf of one of the two states; most likely Japan. In that case, the rocks themselves and the surrounding territorial sea have much less value that the large continental shelf projections of each country and aren’t worth fighting over. (See, Fixing the Senkaku/Diaoyu Problem Once and For All ). It is somewhat curious that China is lashing out at Japan, given that the Senkaku/Diaoyu issue has been rather quiet until recently and the SCS is China’s current problem. Regardless, China would do well to revisit its strategic objectives, especially since the United States declared in April of 2014 that Japan is the lawful administrator of the islands and are within the scope of Article 5 of the 1961 Mutual Defense Treaty. The reaffirmation of solidarity between U.S., Australia, and Japan in the July 25 Trilateral declaration likely provides Tokyo the fortitude it needs to militarily respond if China continues to operate provocatively near the Senkakus. Another important point in this calculus is Japanese President Shinzo Abe. Abe stated in 2015 that Japan is a “maritime state” and can “only ensure its own peace and security by actively engaging in efforts to make the entire world a more peaceful and secure place.” Japan’s record 2016 military budget of roughly $42 billion is further evidence of that goal. 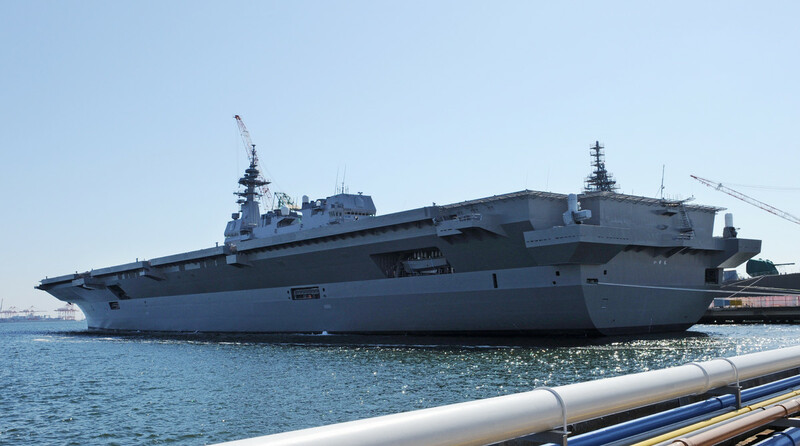 Japan has a combatant fleet of 131 vessels, including 3 aircraft carriers, 43 destroyers, and 17 submarines using frontline U.S. tactics and systems. China has substantially more hulls and submarines, but most naval analysts interviewed by the author cite the excellent Japanese submarine force as a likely game changer. More important is the will to fight. Japan, as noted, has been greatly increasing its military spending even though its economy has been in the doldrums. According to the OECD, output growth has been slowed by a drop in demand from China and other Asian countries and by sluggish private consumption. This indicates that if Japan is pushed to the point that it must militarily respond, it has three valid reasons for using instant and overwhelming force now. First, Japan’s economy is too fragile to become involved in a protracted war with China. It would need to win fast and win big to reestablish economic dominance within Asia. If China is not dealt a mortal blow and forced to capitulate, it will use its economic leverage to coerce states to suspend trading with Japan. Japan’s trading economy cannot easily weather a suspension of its trade relations – even if the U.S. and Australia remain in their corner. Second, Japan cannot win a military war of attrition with China: it suffers from a lack of hulls, aircraft, personnel, and production capacity. Like Israel did in the 1967 six-day attack on Egypt, Jordan, and Syria, Japan would feel compelled to use its current qualitative advantages to deliver a massive blow to Chinese maritime and air forces to dissuade Beijing from further military incursions in the ECS. In a few years, the military edge could shift to China because of its massive building plans. Third, Japanese domestic politics today would likely support a massive strike. This starts with Japan’s new self-defense law which entered into force in March of 2016 and allows Japan to engage in limited coalition warfare. Also, a 2012 Public Opinion Poll by the Cabinet Office shows a nose-dive in Japanese attitudes towards China. According to a 2013 paper by Stimson Center Analyst Yuki Tatsumi Chinese economic ascendancy has been a source of friction as has been the influx of Chinese citizens into Japan as members of the workforce or as tourists. People complain of the increases in crime by Chinese living and working in Japan and bad manners. Finally, the Japanese public is extremely well read and are likely becoming unnerved and physically threatened by the constant scrambling of Japanese fighters (200 times alone in April – June) to intercept Chinese aircraft, ballistic missile tests by China’s “Puppet” in Pyongyang, and live fire exercises in the Senkakus. China needs to ask itself what it is trying to achieve in the ECS. If its intent is to beat Tokyo into submission or lure it into a limited and protracted war of attrition to undermine public support for Abe, it seems very unlikely that Tokyo will take the bait. However, if its intent is to successfully provoke a full-scale military attack, they are likely to be very disappointed, particularly since U.S. forces will be present to backstop the protection of Japan’s homeland. They may also be gravely miscalculating that Japan will only respond to Beijing’s move in a piecemeal fashion. 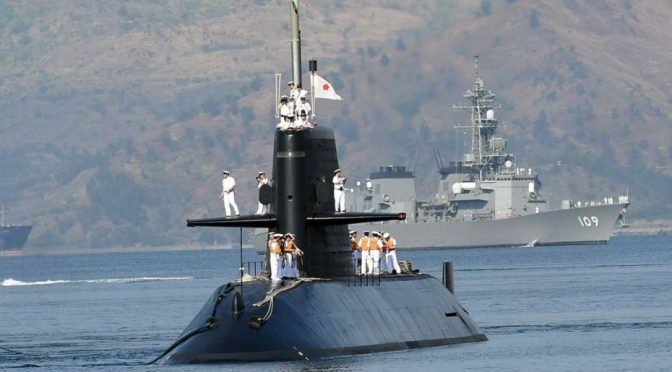 Japan has an excellent and professional Navy – especially its submarine force – and could deliver a knock-out punch to much of China’s maritime forces. Until the combat patrols on August 6 near Scarborough Shoal, Beijing’s recent attention seemed focused on the East China Sea. However, while Chinese threats to establish an Air Defense Identification Zone (ADIZ) in the SCS seemed to have died down, the possibility cannot be reasonably excluded. The question then becomes: does an ADIZ advance China’s campaign to assert its sovereignty in the South China Sea? If China concludes that an ADIZ will send the correct signal that it has sovereignty claims in the SCS, the next concerns are the likely responses and whether or not they can succeed. The United States was the first country to establish an ADIZ during the height of the Cold War as a way of providing notice to Soviet flights entering the zone near the United States that the United States reserved the right to undertake a radio challenge or dispatch fighter aircraft to ascertain the incoming flights course and intentions if it was not flying on a predetermined flight plan. The United States now has four ADIZs in operation: the U.S. ADIZ (Continental U.S.); Alaska ADIZ, Guam ADIZ, and Hawaii ADIZ. Upwards of 20 other countries have established these zones adjacent to their coastlines. These zones do not seek to restrict freedoms of navigation or overflight; their sole purpose is to ascertain a particular flights intention to reassure the coastal state that no surprise attack is being launched. 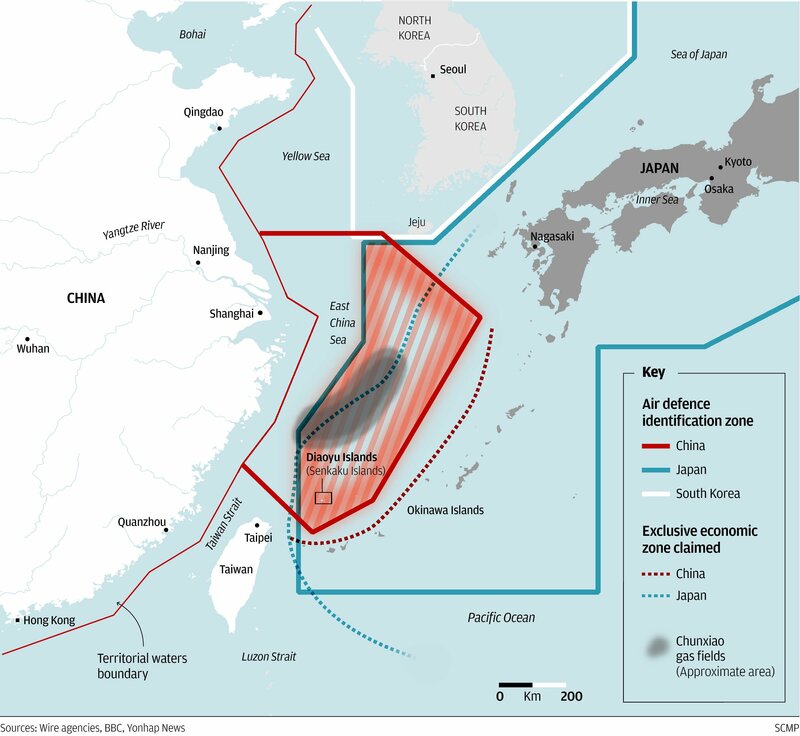 When China established its ADIZ in late 2013 over the contested Senkaku islands, it was diplomatically protested because it was overbroad and inappropriate to defend an uninhabited rock as a sort of occupation measure. China’s ECS ADIZ was also criticized for including civil aircraft flying on established flight plans. ADIZs have no explicit foundation in UNCLOS or other international instruments, yet they are regarded as customary and lawful when used for the limited purpose of identifying aircraft near a country’s coastline, not to deny such aircraft their lawful rights of overflight. 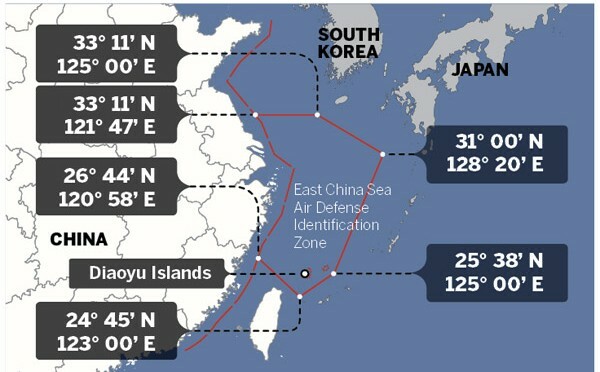 For this reason, the United States and other countries protested the Chinese ADIZ, since it was established to “control and react to aircraft entering the zone” and warned that aircraft flying in the ECS Zone “must comply” with the requirements to provide detailed identification data and “comply with the instructions” of the zone controller. The same legal issues in China’s ECS zone would apply in a SCS Zone. Depending on how it was actually constituted, it would certainly be provocative because it is not associated mainland protection but rather protection of mostly uninhabited rocks and islets from surprise attack. As it relates to military aircraft lawfully operating in the SCS, there is a fear that China will seek to limit military flights to corridors that they can instrument and hold at risk with missiles. There are also the impacts of a large SCS ADIZ and the impact on civil aviation. According to the International Civil Aviation Organization (ICAO), the South China Sea is a “Main Truck” for all traffic on “all routes” and there are concerns that added reporting and routing by Chinese civil authorities will impede international air traffic. The last possibility is that China, through deeds and action, will establish a de facto ADIZ as an adjunct of its promised combat air patrols. It might simply declare that all aircraft flying in the SCS have to provide flight information to Chinese Military authorities or risk interception or being shot down. 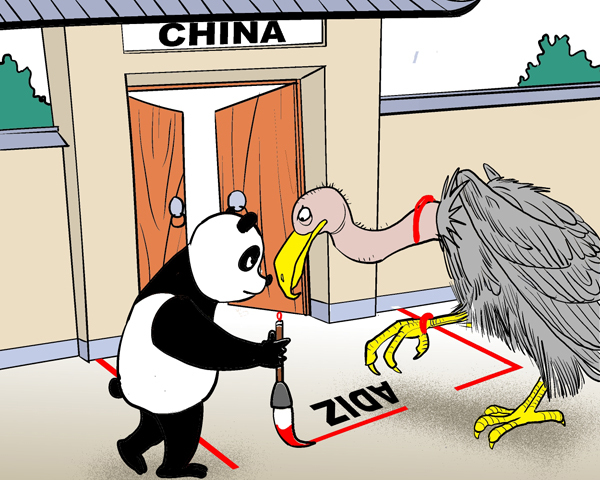 If China goes forward with an ADIZ, it is very reasonable to expect that the United States, France, Australia and even Japan will mount FON-like operations to protest with the zone’s establishment. If these operations are “regular and visible” as suggested by France, China would need to ask itself whether or not it is is achieving its political objectives when foreign aircraft can operate with impunity in their new ADIZ. Also, if China continues to engage in persistent combat patrols around Scarborough Shoal, then a declaration that the United States that regards Scarborough to be within the scope of the “metropolitan territory” of the Philippines under Article V of the 1951 Mutual Defense Treaty is both possible and a fresh challenge to Beijing that would cause it embarrassment. China puts itself greatly at risk if it moves forward with an ADIZ or something resembling it given the widespread international support for the Tribunal Ruling, abhorrence with China’s behavior towards its neighbors, and general concern that China’s bad behavior be deterred. Now that the U.S. has bed down rights in five bases in the Philippines adjacent to the South China Sea, it has gained a significant military advantage in being able to operate fixed wing combat aircraft from land locations to conduct its own FON operations or combat patrols that don’t put a carrier at risk. China’s ADIZ gamble might have paid off if only the United States were involved so that it could “declare victory” in a future contacts with U.S. ships or aircraft such as the EP3 incident. However, given the threat dynamic and the potential to trigger alliance support from Australia and France, China will hopefully conclude that it will be biting off more than it can chew by going down the ADIZ path or, as noted above, further provoking Japan in the East China Sea. The government of the People’s Republic of China announces the establishment of the East China Sea Air Defense Identification Zone in accordance with the Law of the People’s Republic of China on National Defense (March 14, 1997), the Law of the People’s Republic of China on Civil Aviation (October 30, 1995) and the Basic Rules on Flight of the People’s Republic of China (July 27, 2001). The zone includes the airspace within the area enclosed by China’s outer limit of the territorial sea and the following six points: 33º11’N (North Latitude) and 121º47’E (East Longitude), 33º11’N and 125º00’E, 31º00’N and 128º20’E, 25º38’N and 125º00’E, 24º45’N and 123º00’E, 26º44’N and 120º58’E. It is highly unlikely that the East China Sea ADIZ may effectively terminate all the foreign air reconnaissance maneuvers. First, aircraft flying in the East China Sea Air Defense Identification Zone must abide by these rules. Flight plan identification. Aircraft flying in the East China Sea Air Defense Identification Zone should report the flight plans to the Ministry of Foreign Affairs of the People’s Republic of China or the Civil Aviation Administration of China. Radio identification. Aircraft flying in the East China Sea Air Defense Identification Zone must maintain the two-way radio communications, and respond in a timely and accurate manner to the identification inquiries from the administrative organ of the East China Sea Air Defense Identification Zone or the unit authorized by the organ. Transponder identification. Aircraft flying in the East China Sea Air Defense Identification Zone, if equipped with the secondary radar transponder, should keep the transponder working throughout the entire course. Logo identification. Aircraft flying in the East China Sea Air Defense Identification Zone must clearly mark their nationalities and the logo of their registration identification in accordance with related international treaties. 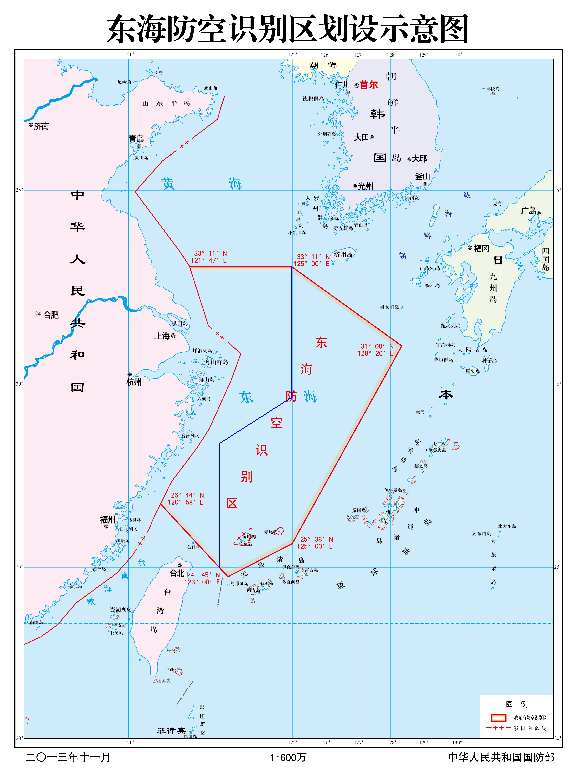 Third, aircraft flying in the East China Sea Air Defense Identification Zone should follow the instructions of the administrative organ of the East China Sea Air Defense Identification Zone or the unit authorized by the organ. China’s armed forces will adopt defensive emergency measures to respond to aircraft that do not cooperate in the identification or refuse to follow the instructions. Fourth, the Ministry of National Defense of the People’s Republic of China is the administrative organ of the East China Sea Air Defense Identification Zone. Fifth, the Ministry of National Defense of the People’s Republic of China is responsible for the explanation of these rules. Sixth, these rules will come into force at 10 a.m. November 23, 2013. For the most part, military observers and political commentators have analyzed the matter from the political dimension. What is lacking is an examination of the validity of these three PRC domestic laws and rules as well as their association with the PRC government statement and the subsequent aircraft identification rules. First, the effective dates of these three laws and rules noted by the statement are indeed questionable. For the Law of the People’s Republic of China on National Defense, it was initially put into force on March 14, 1997, as noted by the statement. Likewise, the Law of the People’s Republic of China on Civil Aviation was originally put into effect on October 30, 1995, also noted by the statement. Nevertheless, according to the “Decision of the Standing Committee of the National People’s Congress on Amending Some Laws” issued by the Standing Committee of the National People’s Congress on August 27, 2009 and subsequently put into effect by the “Order No.18 of the President of the People’s Republic of China”, the Article 48 of the Law of the People’s Republic of China on National Defense was revised. Similarly, contents or wordings of the Article 191, 192, 193, 194, 195, 196, 197, 198, 199 and 200 of the Law of the People’s Republic of China on Civil Aviation were also revised by the same amending process and government document. Hence, the effective dates of these two laws noted by the statement were definitely incorrect after the law amendment process. The original map attached to the PRC East China Sea ADIZ government statement. Moreover, the Basic Rules on Flight of the People’s Republic of China was not initially put into force as noted by the statement. It was first jointly issued by the PRC State Council and the PRC Central Military Commission on July 24, 2000, by the “Decree No. 288 of the State Council of the People’s Republic of China and the Central Military Commission of the People’s Republic of China” after a large scale revision from its progenitor with the identical title established by the same two institutions on April 21, 1977. Based on two separate documents but with the same titles known as the “Decision of the State Council and the Central Military Commission on Amending the General Flight Rules of the People’s Republic of China”, it was subsequently twice amended on July 27, 2001 and October 18, 2007. Also, the revised rules were put into force by the “Decree No. 312 of the State Council of the People’s Republic of China and the Central Military Commission of the People’s Republic of China” and “Decree No. 509 of the State Council of the People’s Republic of China and the Central Military Commission of the People’s Republic of China” on August 1, 2001 and November 22, 2007, accordingly. We therefore may notice that the effective date of the Basic Rules on Flight of the People’s Republic of China noted by the statement was neither the initial effective date of the rule nor the latest effective date of the rule. Based on the survey results already mentioned , we may conclude that the validity and legality of the judiciary documents cited by the statement is undeniably questionable. The quality of this government statement is poor. Second, the jurisdiction associated with the contents noted by these three laws and rules as compared with the airspace defined by the PRC East China Sea ADIZ can also be problematic. The jurisdiction defined by the Law of the People’s Republic of China on National Defense is basically illusive. It does note with the territorial airspace in its text. Yet, the substantial content of this law has never specifically mentioned its jurisdiction may extend to any air defense identification zone. Likewise, the Article 2 of the Law of the People’s Republic of China on Civil Aviation does declare the PRC’s exclusive sovereign rights over its territorial airspace. Many other articles of this law also repeatedly address its jurisdiction over the PRC territorial airspace. By the principle of ratione loci, we may clearly identify the jurisdiction defined by this law never was intended to extend to the airspace over the East China Sea. The PRC East China Sea ADIZ is not a hollow statement. The Substantial interception maneuvers toward the JMSDF MPA by the PLAAF fighters. On the other hand, according to the Chapter 13 and the Article 173 of the People’s Republic of China on Civil Aviation, its jurisdiction does cover those foreign aircrafts or other flying objects within its territorial airspace. Also, by the terms noted in its Article 182, its jurisdiction may extend to certain search and rescue areas out of its territory. Nonetheless, such search and rescue areas are governed by the international treaties and totally irrelevant with any air defense identification zone. Basically, the Basic Rules on Flight of the People’s Republic of China is the administrative rule originated from the People’s Republic of China on Civil Aviation. This is exactly the reason why the Article 1 of this rule specifically noted its jurisdiction only covering those aviation activities within the PRC’s territory. However, the Article 2 of the same rule also extends its jurisdiction over those units and persons with the ownership of the aircrafts as well as the personnel relevant to the aviation activities and the activities themselves. There are numerous articles of this rule repeatedly addressing its jurisdiction and objectives involved in the activities within this airspace as well as the aviation activities themselves. The only exception regarding the jurisdiction out of its territorial airspace ever appeared in this rule is the Article 121 of Chapter XII titled with Supplementary Provisions: “In regard to the aircraft of the People’s Republic of China operating over the contiguous zones, exclusive economic zones or high seas beyond the territorial waters of the People’s Republic of China, where the provisions of an international treaty concluded or acceded to by the People’s Republic of China are different from the provisions of these Rules, the provisions of that international treaty shall apply, except the provisions for which reservation has been declared by the People’s Republic of China.” According to the content noted above, its jurisdiction may only cover the aircraft with the PRC nationality registration. It does not authorize any jurisdiction over foreign aircraft out of its territorial airspace. After reviewing the content of these three laws and rules, we may very confidently believe that there is no basis of jurisdiction over the East China Sea ADIZ ever granted by them. This is another solid evidence of staff work negligence. Third, terms or any substantial contents noted by these three laws and rules are never associated with the airspace defined by the statement or the aircraft identification rules requested by the PRC Defense Ministry announcement. The term of the ADIZ itself was never specifically defined by these three legal documents since it never ever appeared in any text of them. Further, for those means of identification demanded by the PRC Defense Ministry announcement, no corresponding regulation has ever been noted in these three laws and rules. Of course, Article 167 and 168 of the Law of the People’s Republic of China on Civil Aviation as well as Article 39 and 90 of the Basic Rules on Flight of the People’s Republic of China are noted with the term of flight plan, yet, the substantial content is totally irrelevant with the flight plan identification within the PRC East China Sea ADIZ. As for the radio identification, the term does appear in the text of the Article 10, 88 and 90 of the Law of the People’s Republic of China on Civil Aviation for eight times and in the Article 48, 57, 60, 87, 95, 101 and 105 of the Basic Rules on Flight of the People’s Republic of China for a total of thirteen times. Again, the context of these applications is not relevant to the East China Sea ADIZ identification procedures. The term of secondary radar transponder noted by the transponder identification section of the PRC Defense Ministry announcement of identification rules is never noted in these three legal documents. Last but not least, for the logo identification, the term “logo” itself is mentioned by the Article 8, 58, 61 and 85 of the Law of the People’s Republic of China on Civil Aviation five times but the contexts are not substantially associated with the East China Sea ADIZ identification procedures. Likewise, it was also noted by Article 24, 41 and 47 of the Basic Rules on Flight of the People’s Republic of China for six times. The content of the Article 24 and 47 is totally unrelated to the logo of any aircraft. Only the Article 41, “Aircraft operating within the territory of the People’s Republic of China shall bear distinct identification marks. Aircraft without identification marks are forbidden such flight. Aircraft without identification marks shall, when in need of such flight due to special circumstances, be subject to approval by the Air Force of the People’s Liberation Army. The identification marks of aircraft shall be subject to approval in accordance with the relevant provisions of the State,” the content is seemingly in accordance with the East China Sea ADIZ identification rule. Nonetheless, the jurisdiction of the Article 41 is only within the PRC territory, which is not the airspace defined by the East China Sea ADIZ. It is noteworthy that there are various airspaces defined by these three laws and rules. Apart from the search and rescue areas mentioned above, the only other airspace that has the coverage out of the PRC territorial airspace is the “Flight Information Region” noted in the Article 30 and the Article 85 to Article 88 of the Basic Rules on Flight of the People’s Republic of China. The significance of the Flight Information Region is clearly defined by the International Civil Aviation Organization. It is totally different from ADIZ declared by any nation in the world. No confusion can happen between these two terms. The PRC government statements on establishing the East China Sea Air Defense Identification Zone and the Defense Ministry announcement of the aircraft identification rules within this ADIZ are fundamentally reckless. The PRC East China Sea ADIZ has already existed for almost two years. Can we ask the following questions? Does the PRC adopt this ADIZ to expand its sovereign claim as many political accusations ever predicted? Does this ADIZ successfully expand the PRC sphere of influence as many commentators ever actively speculated? Does this ADIZ pave the solid foundation for the PLA to exercise its airpower above the East China Sea as many military experts assessed? Do expanding PRC military air activities associate with the mechanism of this ADIZ? How much national pride is substantially acquired after establishing this ADIZ? Whether this ADIZ actually serves the functions as the PRC government originally claimed? And finally, do we fairly and comprehensively judge this issue by excluding our prejudice first? All readers may have their own answer to these questions. We should never forget that the biased vision may only cause distortion of the fact and creating confusions that hindering us to see the reality. Whether we may fairly observe and assess the regime in Beijing does matter to our future strategic options and welfare. Chang Ching is a Research Fellow with the Society for Strategic Studies, Republic of China. The views expressed in this article are his own. International Maritime Satire Week Warning: The following is a piece of fiction intended to elicit insight through the use of satire and written by those who do not make a living being funny – so it’s not serious and very well might not be funny. See the rest of our IntMarSatWeek offerings here. SILVER SPRING, MD—After a series of logistical challenges filming Deadliest Catch in the South China Sea, the Discovery Channel announced a new spin-off series set off the Somali coast to replace the show for 2014 in what would have been the show’s 10th season. Sources say that Bill Goodwyn, Discovery’s President of Domestic Distribution and Enterprises labeled the most recent season of Deadliest Catch a “goddamn shipwreck” after the series filmed the 9th season in the South China Sea. Despite Discovery’s vision, Deadliest Catch faced a series of hurdles including clashes with Japanese nationalists near the Senkaku Islands, and most recently, the loss of an aerial camera drone in China’s Air Defense Identification Zone or ADIZ. Discovery hopes to rejuvenate the successful ten-year-old franchise with a new spin-off series set in Somalia. 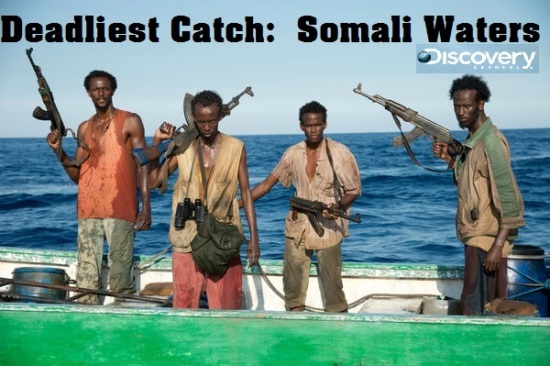 Tentatively titled “Deadliest Catch: Somali Waters,” renowned producer Todd Stanley is attached to serve as the showrunner for this new series, slated to air in early 2014. Richard Phillips and Abduwali Muse are also named as associate producers. 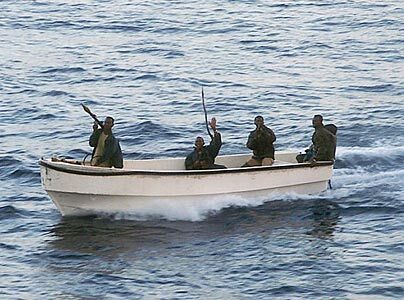 After announcing the series on Twitter, Stanley explained “Look, there’s been a lot of maritime activity off the coast of Somalia for years and frankly the clan dynamics stimulate an enormous amount of competition between Somali fishermen—wait till you see the Habar Gidirs take on the Mijurtinis. 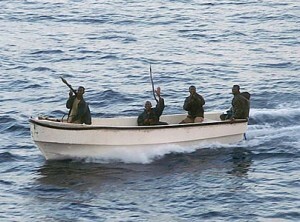 While the piracy business hasn’t been the cash cow for these guys it once was, with our backing you’ll see some of these guys go out for two or three weeks and come back with a load of Yellowfin Tuna, a dry-bulk carrier, or even a handful of Indian hostages.” Officials at the Discovery quickly pointed out that the show abides by all Somali laws and maritime regulations. Bilal Eggeh, an elder affiliated with the Saleban clan, expressed his excitement for the show: “This will not only be a great opportunity for the Saleban to glorify their ancestors against the Duduble filth, but will also provide better programming than Al Shabab behadings and Duck Dynasty.” An Al Shabab spokesperson rejected these comments on Twitter and explained that his organization serves as the main maritime law enforcement organization in Kismayo, a coastal town, and that Nielson ratings show the beheadings do well in the coveted 18-34 demographic. Stanley intends to replicate the filming and production methodology utilized in the Deadliest Catch. Three separate camera crews will follow nominal “fishing” motherships piloted by the Eidagalla, Ajuran, and Ogadeni clans. Additional crews will follow the USS Farragut, on patrol in the Recommended Transit Corridor; the Puntland Maritime Police Force, conducting shore-based operations; and the local coast guard operated by the Digil clan. An additional crew will cover mundane business affairs in the cities of Eyl and Kismayo. Thom Beers will also narrate segments of the series—a staple of the Deadliest Catch franchise. Yet, Discovery remains determined in the spin-off to experiment with the successful formula that other reality shows have used. 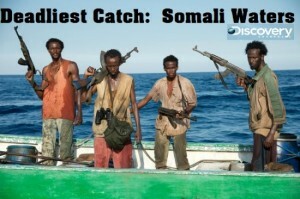 Deadliest Catch: Somali Waters is scheduled to premiere on April 15 at 9:00 EST on Discovery.